Growing up, I always loved to read and write. I knew at a young age that I would strive to work in the English field. And here I am…still striving. As an English Writing Arts major at Plattsburgh State I find that I am always asked the same question: what made you want to be a writer? I have noticed that for some of my peers this is a difficult one for them to answer. However, I know exactly what made me want to write: reading books by Theodor Suess Geisel. You know, Dr. Seuss! I thank my father for my love of Dr. Seuss. He began reading Dr. Seuss’s books to me at just two years old. To this day, he can recite any Dr. Seuss book out there. I was an avid reader as a child but I never knew language could be played with in such a way. Dr. Seuss created his own words and the most fascinating rhymes. I found myself enticed by his style and I wanted nothing more than to write a book like one of his in the future. As I was browsing the internet not too long ago, I read a few articles about new books that would be released by Dr. Seuss this year. As you all can imagine, I was ecstatic. I called my father right away and told him there would be new books for him to memorize. It turns out, some manuscripts by Dr. Seuss were found back in 2013. 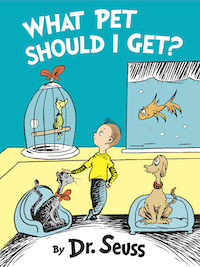 Random House announced that it will be publishing four new Dr. Seuss books. The first of these four will be released on July 28, 2015. It will be called What Pet Should I Get? It also happens to tie in with another one of Dr. Seuss’s books we cannot forget, One Fish Two Fish Red Fish Blue Fish, featuring the same brother and sister! So, what do you all think? Are you excited to see what these new Dr. Seuss books will bring? Or, maybe Dr. Seuss was never really your thing at all. I know that I will be first on line at my local bookstore! I may not want to specifically write children’s books anymore but I still believe I owe it to Dr. Seuss for sparking my imagination. I will continue to support him. Nicolette Marshall is a senior and the Poetry editor for ZPlatt. She hopes to one day be able to recite every single Dr. Seuss book just like her father one day. As a college student, I’m always in the middle of several writing projects. Tomorrow I have to write an essay on Illuminati conspiracist Elizabeth Dilling. After that, I have to hand in an essay summarizing points from my anthropology textbook, and a review of a chapter in one of my English books is due the day after that. The assignments, tediously tied to trivial page number and empty word counts, seem never ending. Why do we persevere? For me, I’m trying to get a bachelors degree from the English Writing Arts program here at SUNY Plattsburgh. Like so many other clichéd young adults, I consider myself a writer; I’ve always been passionate about getting my ideas out on paper, and I’m going to try my hardest to make a career out of that passion. But between the research papers on issues I don’t care about and five-page essays that must be crafted to a certain opinionated professors beliefs, the passion is gone. We’re putting words on paper, but are any of us really writing? This issue came up at the beginning of the semester in my Rhetoric class. Dr. Tom Friedrich, a young professor with sincere interest in his students, asked us how we keep writing for ourselves while trying to manage full-time course loads, or if we abandon “real” writing all together. When we get wrapped up in other obligations, we must never forget to sit down and try to get something on paper. If we simply cannot find the time, we should be forgiving of ourselves and always keep in mind what we truly love to do. For me, afternoons by the lake with my notebook have become less frequent the longer I’ve been at college. But now that the weather’s warming up, I find myself thinking of all the poetry I’ve written on that bench by the river more and more often. It’s these thoughts that remind me why I’m working for this degree. As the submission deadline for the 2015 edition of ZPlatt approaches on Wednesday, let us remember what we love and why we love to do it. To all that have submitted so far, the staff is endlessly grateful for you all sharing your work with us. If you haven’t yet, know that it isn’t too late! Try to sit down with a pen and a notebook before this semester is over. 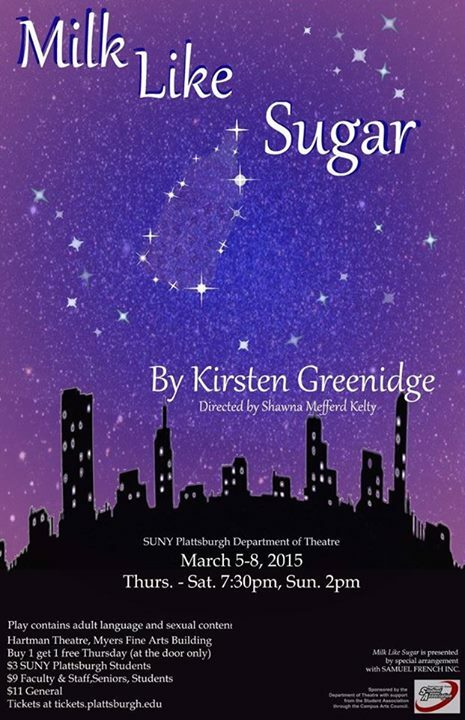 This weekend SUNY Plattsburgh’s Theatre department is putting on a production of Kirsten Greenidge’s play “Milk Like Sugar.” Its opening show this Thursday was fantastic. The play features three young girls who have made a pregnancy pact, not fully understanding the severity their actions. The play follows Annie as she searches for a way to live the best way she can. It shows us what people make of the lives and situations they have been given. The production was captivating with both funny and serious moments; it had us laughing and feeling for the characters. The actors and crew did a great job and I would recommend this show to anyone who can make it to campus this weekend. There will be three more shows: Friday and Saturday nights at 7:30 and Sunday afternoon at 2:00. Tickets are three dollars for Plattsburgh students, nine for faculty, seniors, and students, and eleven for general admission. Enjoy! This post was written by Melanie Kiehl. Melanie is a junior and ZPlatt’s Fiction and Drama editor. She is also a great lover of the arts. For many of us, books are among our most treasured possessions. 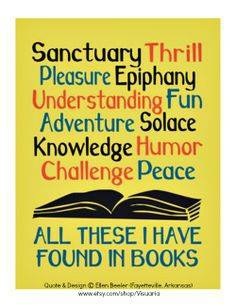 Books are our escape, our adventures, our dreams, and our assistance when times are hard. Bookshelves hold our treasured possessions and yet set them out for the world to see because books are an expression and an extension of who we are. The ZPlatt Staff and friends have gathered pictures of our bookshelves in order to show you what we love; we display our treasures for you to see! 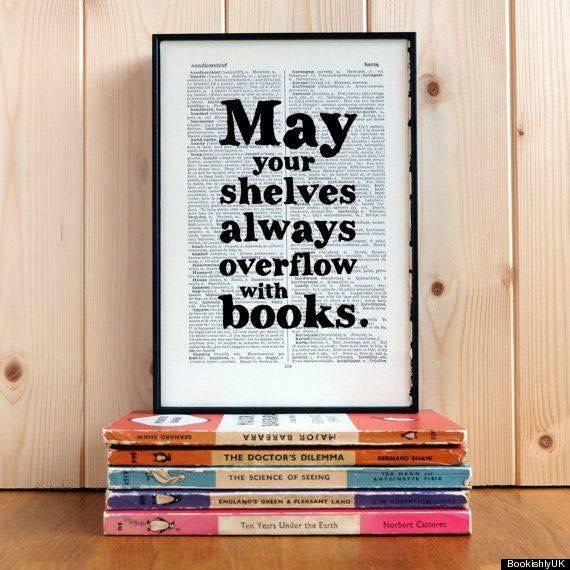 Please feel free to comment or send us a picture of your bookshelves so we can add yours as well! My own bookshelf used to belong to my father. It’s a heavy, real mahogany bookshelf and it has become a place where I honor my father and my love of books. 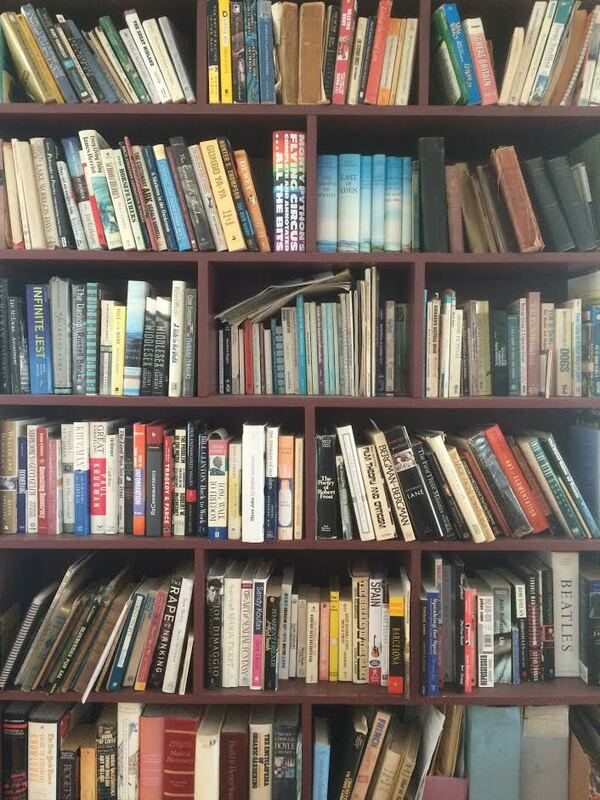 This bookshelf belongs to Veterinarian Dr. David Goldwasser which includes his childhood books on animals. 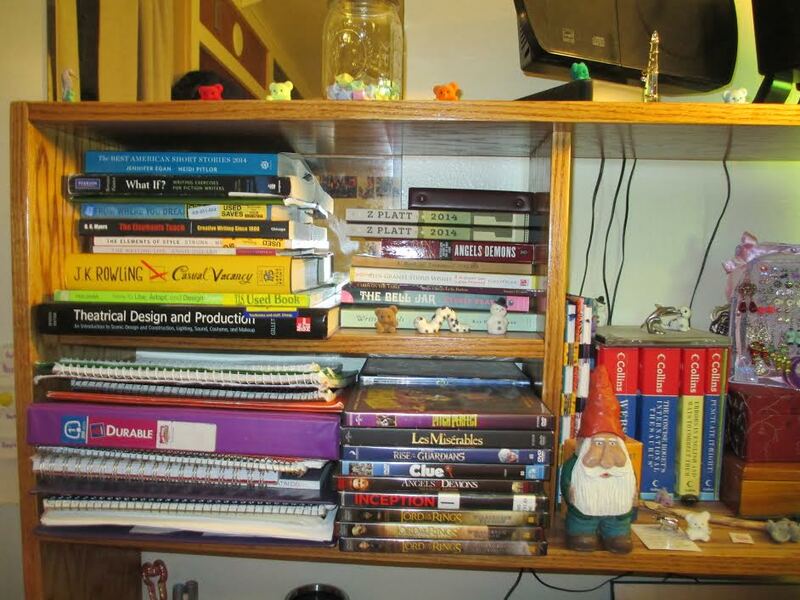 The following two photos show the bookshelf that belongs to ZPlatt staff member, Jason Diebel. 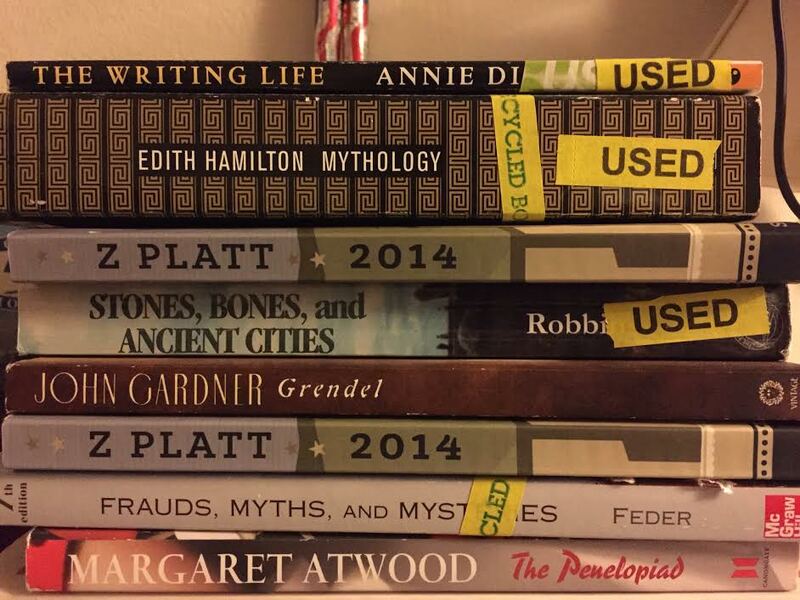 The last, but most certainly not least, bookshelf belongs to ZPlatt staff member Melanie Kiehl. Don’t forget to share your bookscases in the comment below or email us at zplatt2015@gmail.com!